Jillycakes Orlando perfect Cupcake Diet covers Breakfast, Lunch & Dinner! Who said the cupcake craze is over? 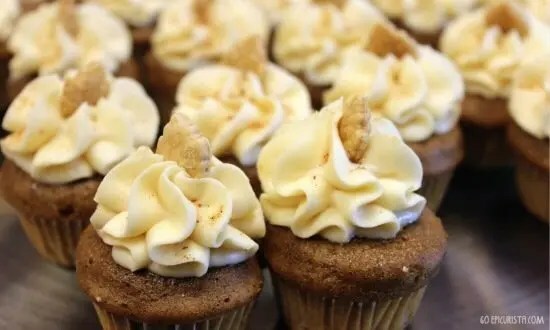 The cupcake may no longer be the latest food trend yet its popularity continues. Not as a trend but as a staple that is here to stay. 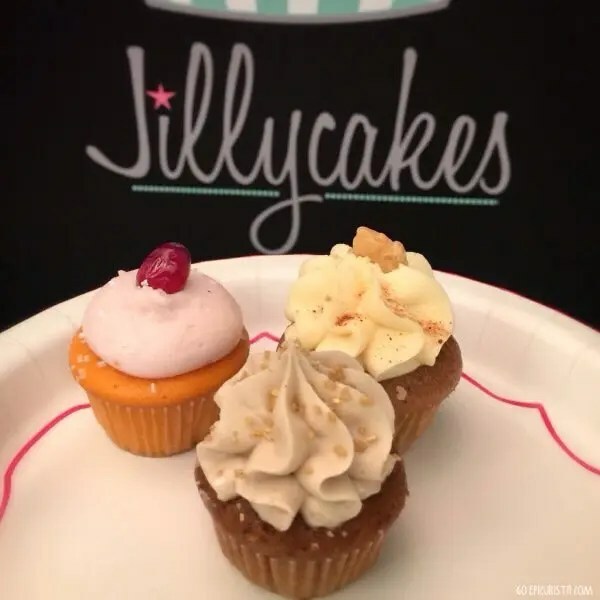 In Orlando, the cupcake craze is alive and well, better than ever, now that local favorite and Food Network Cupcake Wars season 6 winner, Jillian Hopke has opened her Jillycakes Orlando retail store in Winter Park, FL. 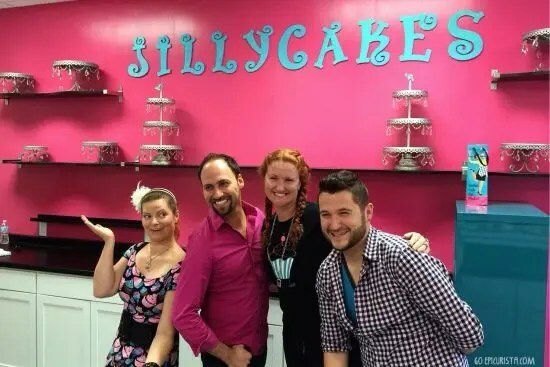 With a fun opening date of 12/13/14, Jillycakes is making Central Florida cupcake lovers very happy. She has run a successful online business for several years, creating custom orders for cupcake and cake lovers from all over the world. She even delivers to area hotels truly catering to Orlando’s tourist market. 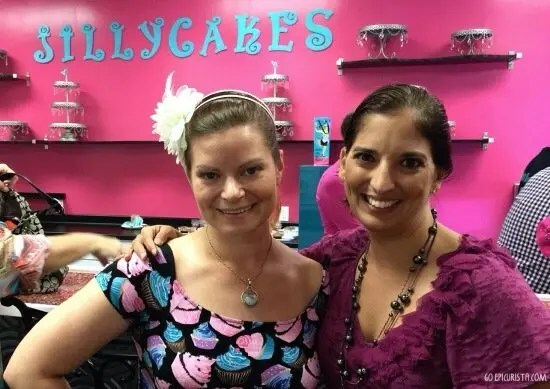 What sets Jillycakes Orlando apart from the many great cupcake stores out there is Jillian and her team’s amazing creativity. Fun with the Jillycakes Orlando team! Jillian is pushing the boundaries of what you think of a cupcake. Her goal is to make it memorable and she succeeds. It is no longer just vanilla with vanilla cream frosting. I love those, but let’s face it, they are pretty boring and there’s only so much you can do to dress them up. Jillycakes Orlando has created deep-fried cupcakes, one of the first commercial bakeries to do so, as well as offering an incredible selection of savory cupcakes and unique flavor combinations. She is taking an anti-cupcake direction with a blend of savory and sweet flavors that I think could be the perfect cupcake diet (disclaimer: I am not a dietitian!). This cupcake lover was thrilled to attend a media preview event to check out the new store, located in the Lakeside Winter Park shopping plaza, between Trader Joe’s and Shake Shack. It was a pleasure meeting Jillian, a self-taught baker who is just as bubbly and genuine as she appears on TV. Check this off the #SomedayList! I got to meet a Cupcake Wars Champion! Of course we got a chance to taste (devour / inhale is more like it!) a selection of her savory and sweet cupcakes while we mingled and listened to behind the scenes stories of reality TV. 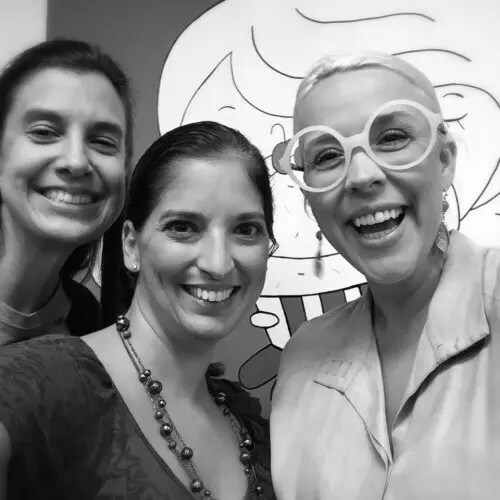 Emily Ellyn, the Retro Rad Chef who competed against Jillian in a Fan Favorites episode, was in attendance as well. Hearing their banter and fun tips made me wish they had a reality show of their own. C’mon Food Network, make it happen! This was my first time trying a savory cupcake. Although I am pretty adventurous when it comes to food, I must say Mac ‘n’ cheese and Jalapeno Popper cupcakes gave me reason to pause. I thought I would just take a bite to sample and move on to the sweets. I thought wrong! 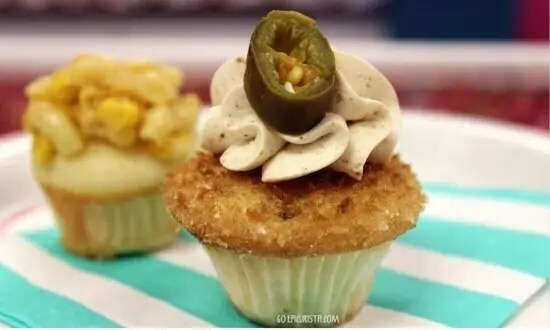 The Jalapeno Popper cupcake was a perfect Southern treat. The cake base reminded me of a moist cornbread and the icing packed some heat! Topped with a jalapeno slice, perfect for an appetizer for those that love spicy foods. 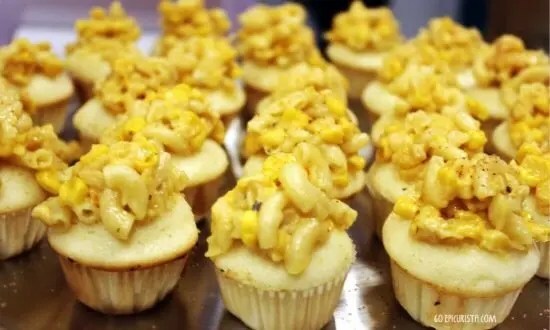 The Spicy Mac ‘n’ Cheese Cupcake was topped with actual macaroni and cheese and it was quite tasty. Not as spicy as I would have expected from the name but full of flavor. I think this could be lunch! 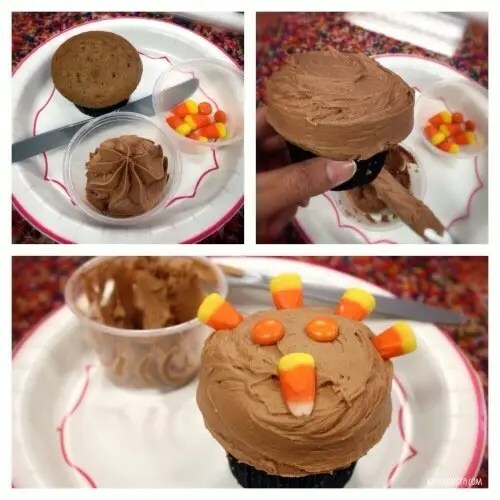 I was totally won over when I tried the Thanksgiving Dinner cupcake, a complete meal in a two-bite treat. It was an explosion of all the Thanksgiving flavors we love. 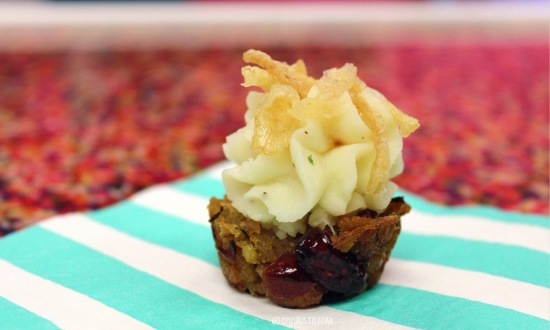 Using a mixture of turkey, cranberries and stuffing as the cake base with Jillian’s grandmother’s whipped sour cream mashed potatoes as the icing, then topped with gravy and crispy onion strings, it was perfection. If you try nothing else, this is the one to have. I guarantee you will be hooked. Thanksgiving Dinner in two bites! I was tempted to get a party tray of these sensational cupcakes to serve instead of Thanksgiving dinner! Thanksgiving Dinner on a tray! After our fill of savory treats, perfect to serve as hors d’oeuvres for a party, we were treated to a demo and Jillian’s cupcake decorating tips. She is available for private events which would make such a fun outing with friends. I was quite impressed with my little Turkey themed cupcake but I think I will leave this to the experts. We then sampled the sweets! Pumpkin Pie cupcake had a pumpkin pie filling in the center that made it oh so decadent. I am not a big Pumpkin pie fan but this, this I could eat all year long! 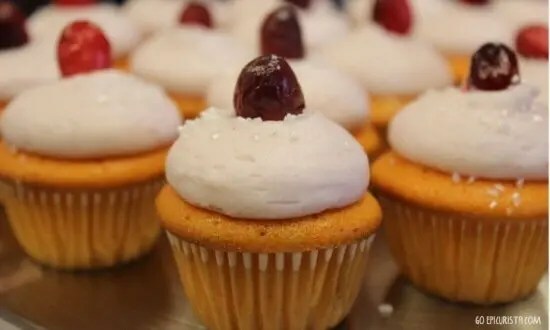 Jillycakes Cranberry Orange cupcake had a nice sweet tart flavor combination and a very airy fluffy cake and icing. I would love to serve these for a tea party. They were not only beautiful but delicious. 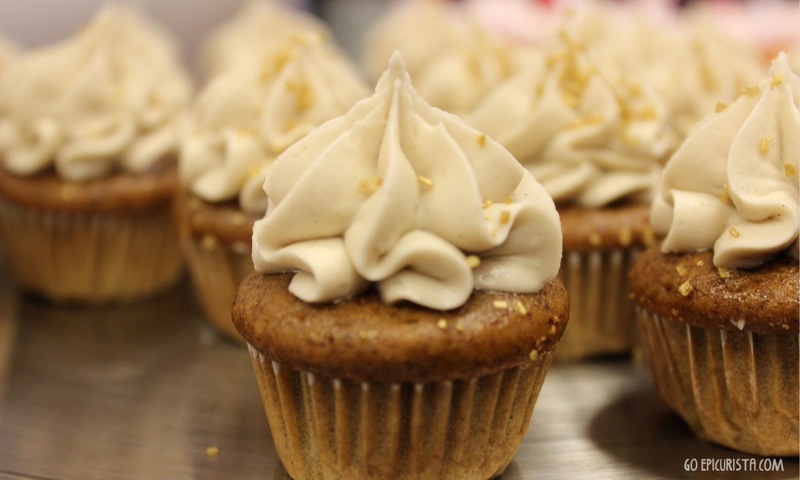 The Maple Apple Gingerbread cupcake was my favorite sweet that night. The hint of spice with the warm apple in the center was like Fall in a bite. 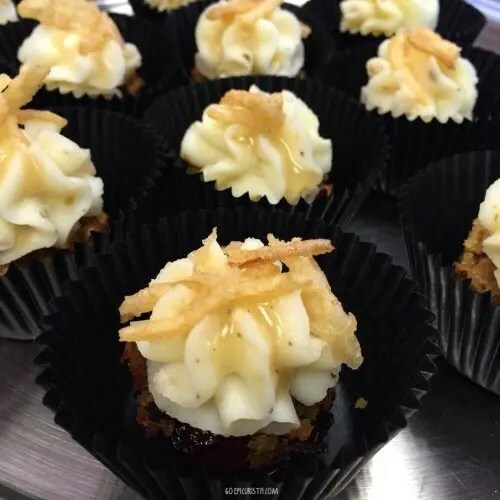 Offering over 40 flavors of cupcakes, Jillycakes can customize and create cupcakes, flavored cakes and layered cakes for any occasion, including weddings. Her creativity seems to have no limits. Just tell her your theme, she is likely to find a way to make it happen. Sushi style cupcakes for an Asian themed party? She’s done it! She won cupcake wars with colleague Daylyne Graff where the theme was the America’s Cup Race and actually used fish in a cupcake! I encourage you to challenge her. She seems to thrive on it. As we chatted, she was throwing around various ideas she was currently testing that sounded quite fun. I promised to keep them secret but I am sure they will be phenomenal. For the Harry Potter fans, she has a butterbeer cupcake. 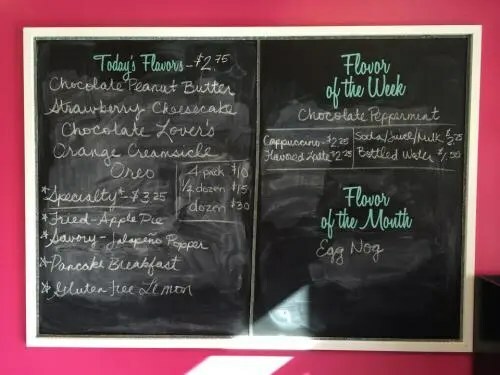 Caramel Popcorn, one of her first savory sweet flavors, is still popular today. If I could survive on eating cupcakes, I would eat nothing else. On my list to try next is the Pancake Breakfast, made with buttermilk cake and maple icing topped with candied bacon and maple syrup. Can you imagine? Jillycakes has breakfast, lunch and dinner covered. I think I might be able to survive on a cupcake diet after all! Their motto is “where every cupcake is an experience and every cake is an extravaganza”. Jillycakes is all about creating memorable experiences. I think these cupcakes would make any gathering an unforgettable special occasion. I encourage you to GO! #EatLocal and support this local bakery by visiting the store at 125 N Orlando Avenue, Winter Park FL, or place your orders online. Follow Jillycakes Orlando on Facebook and Twitter as their flavors are always changing. Would you be up for the Jillycakes cupcake diet? What flavors would you choose? Let me know in the comments below. Jillian is AMAZING. She is not only an incredible baker for all her clients (you must try the key lime cupcake), she is a supporter of the community as a whole. During Epilepsy Awareness Day (March 26h, 2015), Jillian worked with my son to create a special purple cupcake for the day. The cupcakes were sold as a fundraiser for Sam’s service dog, Sybil. She is amazing! I wish I lived closer so I could have her cupcakes all the time! I love it when local businesses get involved in the community like she has. Thanks for stopping by and checking out Go Epicurista. Hope to see you around here again Andrea. Cheers! 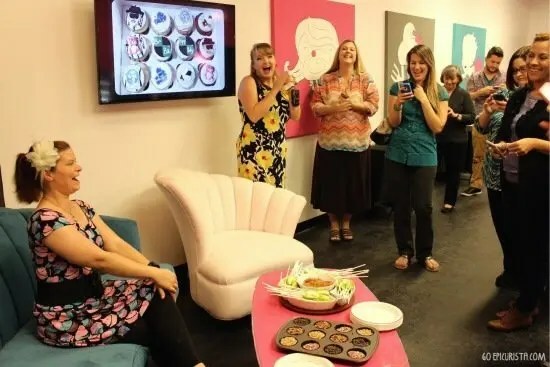 I didn’t realize she won Cupcake Wars! That’s very cool. All of those cupcakes look amazing! I need to stop in the next time I’m on that side of town. Jillian is incredibly talented. It’s a definite “Must Visit” spot when in Winter Park. Thanks for stopping by the blog Kelly!